Signature ingredient: Gentle cleansing lather of organic lemon enriched with vitamin E, panthenol and arginine. Product description: Perfect for frequent washing. Gentle, effective cleansers blended with moisturizing glycerin and certified organic lemon cleanse, refresh and moisturize hands. Features and benefits: Formulated with a special blend of gentle, plant-based cleansers, our certified organic herbal blend, certified organic essential oils, our signature vitamin and amino acid complex special skin conditioners as well as moisturizing glycerin. Directions for use: Work into rich, moisturizing lather. Rinse clean. This is the first soap in a while that I've been able to tolerate and I have very sensitive skin which leaves me itchy. This is worth every penny. My family has been using this product for many years and we keep on ordering it. Nice smell; rinses off well. Good product! I've been ordering this product from Well.ca for many years. Will continue to purchase. All time favorite hand soap! Wash your hand good, let a great fragrance and disinfect! I love it! Love this line of soaps, been using them for years. I have asthma and cannot use products that have too many chemicals, and these soaps are just perfect. Love love love them. 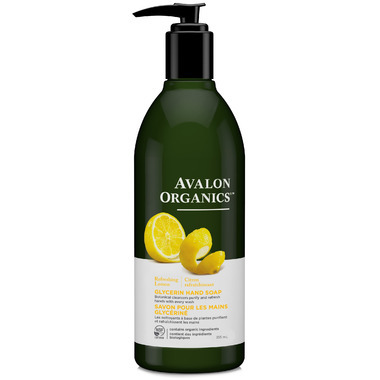 Love the Avalon Organic lemon glycerine hand soap and lotion! Service was great! This soap is great. It has a mild scent that is barely noticeable, and it's gentle on hands but gets them clean. The soap is high quality, but it smell like Mr. Net. Great mild smell (no offensive artificial fragrances), and gentle on hands. Avalon products are great! Favorite soap smells lovely,nice green bottle will purchase more. As a person who has chronic eczema on her hands, washing my hands is always something I don't look forward to. I finally found this hand soap and have found it to be very gentle on my hands which is a great bonus. Nice smell, gentle on skin, great product. Very nice lemon scent and smooth hand wash! love it even more since it is organic! Smells great! Leaves my hands clean but not dry! Love how all of Avalon products are made with recycled products! i don't know what it is with these bottles... i have a lot of touble getting the plunger up to start use. also the soap keeps clogging the plunger so it squirts everywhere. nice scent, performs well enough. A great soap. I was sold on it when I found it on the PETA friendly product list and I love the ingredients in it. It's worth spending a bit more money on my hand soap knowing how good it is to be using this on my skin as opposed to Bath and Body Works. I can't say anything bad about this product. It smells clean & fresh, does not dry out my hands like some other hand soaps, and a little goes a long way. The fact that it is organic and not tested on animals is the icing on the cake. Great value for my money. This handsoap is great, love the smell & it has plant based materials. Will always but this product. I love this soap, it is soft on the hands & it smells great. I have sensitve skin, so this is great for my hands.